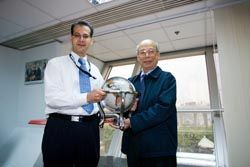 Soundwell's CEO Mr. Chui accepting recognition for his company's 40 years witrh Shure.NILES, IL--One of Shure Incorporated's longtime partners, Soundwell, is celebrating its 40th year as the Shure distributor in Hong Kong. The company was founded by its current CEO, Mr. Chiu, and has successfully established a strong presence in major Hi-Fi and professional audio channels. "We would like to congratulate everyone at Soundwell and express our sincere appreciation for their 40 years of contributions and loyalty as a Shure distributor," added Sandy LaMantia, president and CEO of Shure. "They are a world-class company, and we are very proud to still be doing business with them after all these years." "Shure is a professional brand that I can always trust," commented Mr. Chiu. "Shure is the world renowned microphone manufacturer and a company driven by innovation to ensure high quality products to its customers. Our relationship has been fruitful and successful."